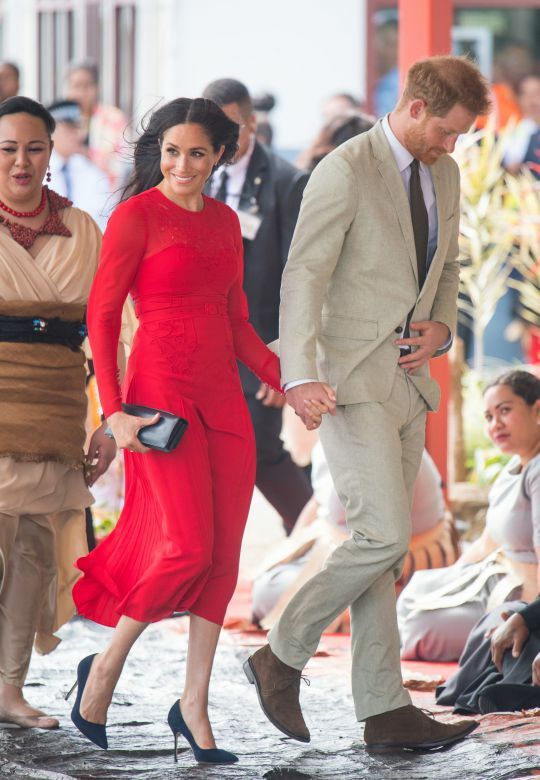 "Meghan had a rare dress fail as she and Prince Harry landed in Tonga today. The label on her form-fitting red dress could still clearly be seen as the royal pair got off the plane on the tenth day of their tour. The £345 red floral Self Portrait dress mirrored the colour of the Tongan flag." Maybe they intend to send it back? Isn't that a social faux pas to point it out publicly? I like his shoes. They appear to be Clark's Desert Boots, in a dark brown colour. Sheik-casual with a lightweight, summer-cotton suit. Ah, but imagine the late, great Queen Salote Tupou the Third of Tonga worrying about such things. Oh boy, what a woman!!!!! On the grand scale of things it doesn't matter....as a conversation about gossipy rubbish, it's incredibly important. Original Quill wrote: I like his shoes. They appear to be Clark's Desert Boots, in a dark brown colour. Sheik-casual with a lightweight, summer-cotton suit. I cant see Prince Harry wearing common old Clarks shoes....they are probably made to measure designer boots that cost a fortune....they go with his suit though...he looks great. Vintage wrote: Maybe they intend to send it back? Are you joking Vintage, it's what the paparazzi live for. She was a guest at the Coronation of Queen Elizabeth in 1953, and as I recall from some of the newsreels at the time (Yep! I was 14 year old grammar schoolboy at the time) her presence almost upstaged that of our own Queen. Imposing is too weak a word! Why?? You can get Clark's for about $120, less at one of their outlet stores. They are clearly Clark knock-offs, if they are not real. Why pay more than the original for knock-offs? Harry doesn't strike me as a conspicuous consumption type. Why pay more? thats the sensible way of thinking Quill not the Royal way....though I'm sure the royal males are not quite as extravagant as the women...and Harry does seem to be more grounded than many. However I dont think the Royal family are known to shop on the high street, some may recycle their clothes, the Queen. Princess Anne and Diana often did, they would turn up in an outfit they had worn years before......not sure Meghan will do the same. Her latest atrocity....designer dress is reported to have cost up to £10.000 depending on which account you read. I disagree with royals wearing these very expensive clothes in today's austerity climate, tho I understand the many reasons why they do. Skinny Meghan has got curves at long last. Glorious curves, bursting out everywhere!! Those pregnancy hormones have her blooming & blossoming & glowing. Pregnancy has a truly magical effect on the human body. I'm always amazed how much these dresses cost, while I understand its very hands on the seamstresses don't get that much money. what's this one, a few yards of net, I suppose the top layer is the expensive bit but £10,000 or so? That said I quite like it, wouldn't wear it though. Hi Vintage. Yep, sadly those at the bottom of the pile don't get much, they never do. It's like the building of iconic buildings. The architect who sits in a comfy, plush leather chair and sketches the design gets millions of £££'s - while the workers who toil laboriously for months/years in all weathers to lay the bricks get paid the least amount and some perish in the process. How much they might be "worth" would be pure conjecture on the part of young female journo's attempting to outdo one another with their gossip fest..
Syl wrote: Why pay more? thats the sensible way of thinking Quill not the Royal way....though I'm sure the royal males are not quite as extravagant as the women...and Harry does seem to be more grounded than many. Knock-offs are a way of getting something that looks the same, and paying less. The point is to suggest the original is the prototype...the better, so to speak. It doesn't make economic sense to upgrade a lesser...just select another, better shoe, like Bally. Knock offs are usually cheap if not nasty, OK for the trend of throwaway fashion which seems to be ruling the high street now. I agree if you cant afford the original pick something cheaper but still of good quality. Why do these women feel the need to spend thousands on clothes? It's not as if they look particularly expensive, and who cares anyway? It's just silly. Raggamuffin wrote: Why do these women feel the need to spend thousands on clothes? It's not as if they look particularly expensive, and who cares anyway? It's just silly. She should take advice and curtail her extravagant spending part funded by the British taxpayer. She is popular, but that could change if she keeps buying such expensive clothes. 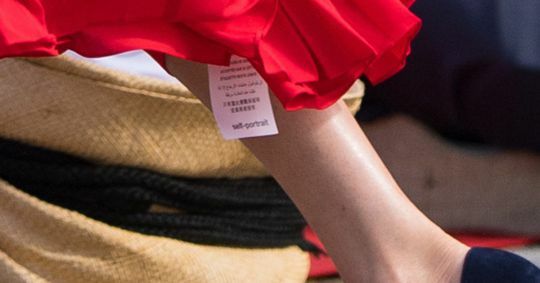 Does she buy her own stuff or does Charles foot the bill as with William and Kate, out of the Duchy of Cornwall and the Queen's tax payers allowance that he gets some of. Vintage wrote: Does she buy her own stuff or does Charles foot the bill as with William and Kate, out of the Duchy of Cornwall and the Queen's tax payers allowance that he gets some of. She will be entitled, now she has married into the higher ranks of the royal family, to money from the sovereign grant..I think it used to be called the privy purse, in any case it's tax payers money, and is now worth 45 plus million per year. When she was sigle and self funding she could spend what she liked on clothes....but with privilege comes responsibility. Millions are struggling, spending 10 grand on a dress, which she will probably only wear once, is obscene imo. Charles does fund a lot of his stuff from the Duchy of Cornwall which is run as a going concern, he does get money from the civil list as Prince of Wales. I know the Royal women use home grown fashion houses to boost their international business, Kate uses High Street fashions as well, not ones I would use though, £400 for a dress however nice is not something I would consider paying but I suppose they have to look good, so £400 may be a bargain. I wear my shoes until they can't be worn any more but £575 for a pair of shoes they may be made for you and you get your wear maybe over the years but really? Kate and Meghan are too thin, I think at least, I don't expect them to be my size and I know clothes look better on a stick but they need a bit of flesh on them. If she uses public money, she has a duty to give value for money to the tax payers, and I don't think that spending thousands on a frock is good value for money. Raggamuffin wrote: If she uses public money, she has a duty to give value for money to the tax payers, and I don't think that spending thousands on a frock is good value for money. Kate is contributing in the best, perhaps most personal way...with her womb. So did Diana, she produced a heir and a spare, and was treated like a leper for her trouble. But justice comes to the surface. Look how popular the boys are, particularly the ginger one. I attribute it to the waning influence of the Germans in the royal bloodline. Justice came to the surface sadly too late for her. I attribute their popularity to the way they were treated when she was alive...she loved them and replaced the cold upbringing of previous royal children with a more emotional and down to earth childhood. Thanks to her the royal family are popular again, without her influence it would be a very different royalty today.